Dymension is revolutionary software that can analyse a typical 2D gel image rapidly. It features novel algorithms for background subtraction, noise filtering, precise alignment, spot detection, rapid matching and reduced image editing time. Using its powerful spot detection algorithm, Dymension instantly locates and analyses protein spots. 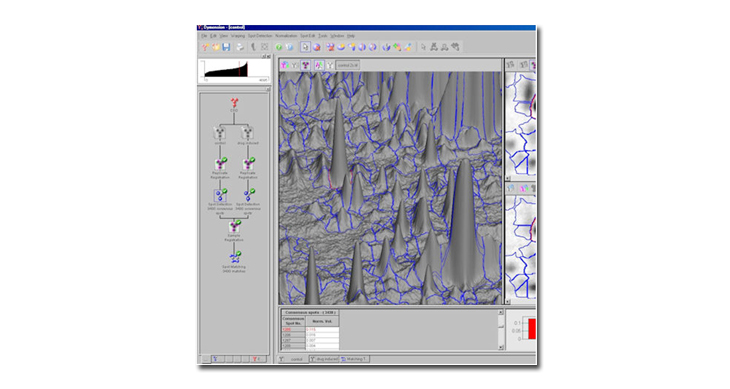 With Dymension, the entire analysis process from background correction to spot matching results and reporting takes minutes, making this the fastest 2D gel analysis package currently available. Dymension is available in three versions, and upgrading between the packages is simple. analysis of single 2D gels Dymension 1 is ideal for users looking for software to analyse spots between samples containing one 2D gel only. It offers a range of automatic image correction features and methods of resolving and analysing spots on single gels. The software can be easily upgraded to Dymension 2 or 3 if the proteomics needs of the laboratory change. rapid analysis of multiple 2D gel sets Dymension 2 has all the features of Dymension 1 but has the added ability to detect and compare protein spot maps in samples containing replicate gels. The software offers many background correction and noise filtering features including a SYPRO® Ruby filter, which can detect and automatically remove spots caused by SYPRO® Ruby crystals adhering to the gel, thus saving users valuable time editing their image. Dymension 2 is suitable for users that need to determine the amount of protein present before and after drug or protein induction treatments. The software automatically detects and assigns statistical confidence to each and every difference in spot normalised volume, thus accurately highlighting proteins of specific interest. The results of the analysis are displayed as a dynamically linked table, 3D spot profile, bar chart, correlation and scatter plot, which make it easy to compare many expression profiles simultaneously and therefore accurately pick proteins suitable for further analysis. quick and easy analysis of all 2D gel applications Dymension 3 is exciting software, which has all the functionality of Dymension 2 so can be used to analyse samples containing replicate gels. Dymension 3 has the additional capability to analyse multi-stained fluorescent gel images stained with up to three contrasting labels, eg, Cy™2, Cy™3 and Cy™5. This feature allows users to analyse multiple sets of any type of 2D protein gel, regardless of how it was stained, using only one software package.